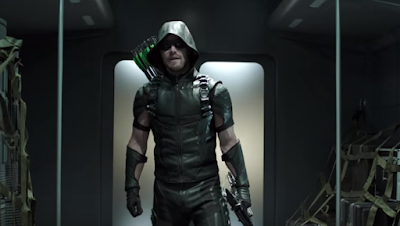 Arrow's Season 4 Trailer Has Felicity with a Machine Gun, Constantine, Speedy and Much More! Ollie in his new season four costume. The Arrow season four trailer finally arrived and it did not disappoint. It's packed with familiar faces and a bunch of new ones. Yet, it's the original Team Arrow that is back and better than ever. The fast moving montage of moments has everything! Olicity living in supposed suburban bliss. Starling City renamed Star City in honor of the "dead" Ray Palmer. Say what?! The resurrection of Sara Lance. Thea in action as Speedy. Diggle in his new Magneto helmet. Papa Lance hating on Team Arrow again. The introduction of the big baddie Damien Darhk played by Neal McDonough. There's a sneak peak of Matt Ryan reprising his role as John Constantine. Constantine! Not sure which was more badass, Felicity with a machine gun or this sequence with Curtis Holt (Echo Kellum) the future Mr. Terrific. Watch the first of many viewings of the trailer now! Arrow returns for season four on Wednesday, Oct. 7 at 8 p.m. on the CW.